What Ethnic Groups Have an Increased Risk of Developing Diabetes? 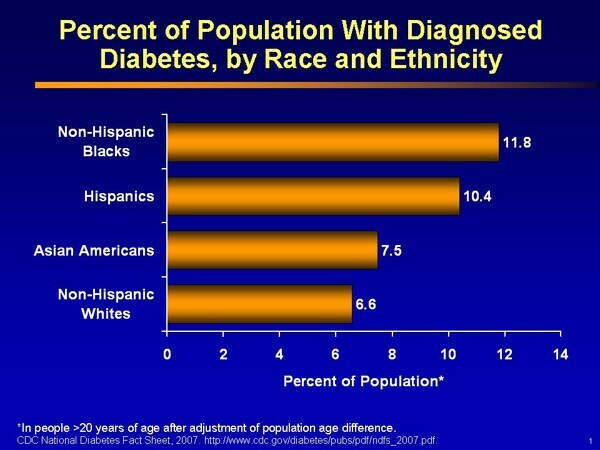 Diabetes disproportionately affects minorities in America. Why Are Some Populations More Prone to Developing Diabetes Feet? The CDC explains that there are various factors that make some populations more prone to developing diabetes than others. – Genetics: For one thing, diabetes tends to run in families, with several hereditary factors that come into play. Researchers believe that inherited genes affecting immune response and insulin function contribute to the developing of type 1 or type 2 diabetes among family members. – Evolution: Researchers believe that African Americans, Latinos, American Indians, Asian Americans, and Pacific Islanders also pass on an evolutionary gene that helped their ancestors store food energy during times of plenty to survive scarcities. While this ability was responsible for survival in tribal societies, the “feast or famine” situations are rarer these days. Therefore, a gene that was once a key advantage has now become a hindrance for minorities in America. – Resources: Additionally, poverty and lack of access to health care can be a barrier for the preventative maintenance and diabetes management that some minority Americans need. SteriShoe UV Shoe Sanitizer: A Product for Populations with Diabetes! Two to three percent of people with diabetes will develop recurring ulcers each year, and about 15% will have a diabetic foot ulcer at some point during their lifetime. Diabetes feet problems greatly impact one’s functional status and quality of life, so it’s important to do everything possible to keep this part of the body healthy. Shoe Care Innovations developed the SteriShoe UV shoe sanitizer to make it easier for people with diabetes to keep their footwear sanitized and free from MRSA, Staph, pneumonia, athlete’s foot fungus T. Rubrum, and other harmful pathogens. This affordable and easy-to-use device goes inside your shoes. You then place your shoes inside our shoe bags. With the push of a button, natural UV light is deployed, which kills up to 99.9% of all organisms living in your shoes within one 45-minute cycle. For best results, use daily to keep your footwear germ-free! You can try the SteriShoe UV shoe sanitizer risk-free for 30 days. Get your money back if you are not 100% satisfied.